RuUp4It? : Our first R U Up 4 It? Polytunnel is open for growing! Congratulations to Muirtown Primary. Our first R U Up 4 It? Polytunnel is open for growing! Congratulations to Muirtown Primary. A few shots from yesterday's lively (if cold) opening ceremony. It was a fantastic occasion, thanks to everyone that came along. This shows that one school, with the support and enthusiasm to do so, can make so much of their outside space - it's just as important a classroom as the classrooms inside the school. We were joined by the Provost of Inverness, Moray Firth Radio and a big crowd of parents, grandparents, staff and most importantly PUPILS! They served hot food, drinks, apple crumble and my favourite was the plum jam - almost everything came from their school garden (with a little help from a shop or two). 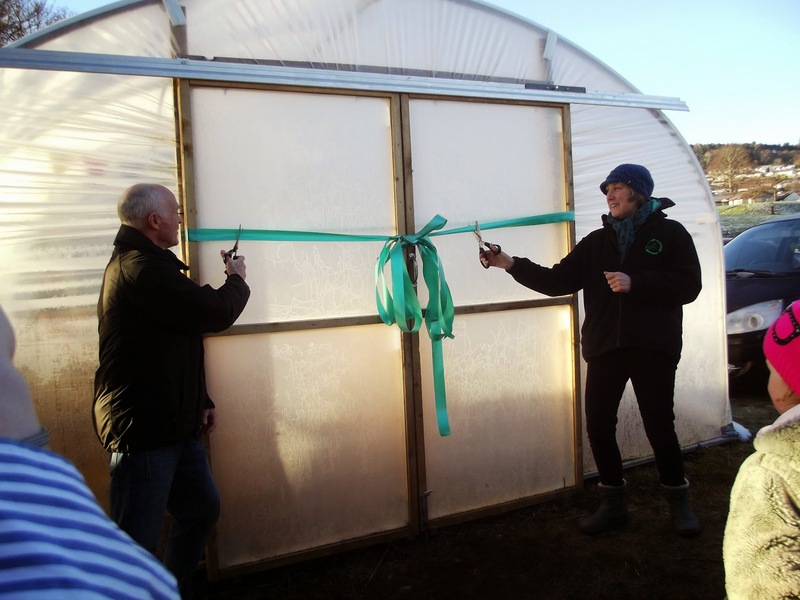 Norman and Toni from RoWAN cut the ribbon (note the colour matches RoWAN's green). The soup and school-made bread warmed us all up. Thanks. Strawberries and a grape vine being planted in one of the eight raised beds. Inverness High School, Lairg Primary School, Beauly Primary School, Tarradale Primary School and Loch Duich to name a few.